The Mustang had been designed and built by North American Aviation, Inc., as a fighter for the Royal Air Force. Two Mustang Mk.I airplanes, the fourth and the tenth from the RAF production line, had been given to the Air Corps for evaluation and designated XP-51, serial numbers 41-038 and 41-039. Prior to this, the Air Corps had ordered 150 P-51 fighters, but these were Mustang Mk.I models to be turned over to England under Lend-Lease. 43-6003 was used for testing and was equipped with skis for takeoff and landing tests in New Hampshire and Alaska. The North American Aviation P-51A Mustang was a single-seat, single-engine, long-range fighter. It is a low-wing monoplane with retractable landing gear and is of all-metal construction. It was 32 feet, 2½ inches (9.817 meters) long with a wingspan of 37 feet, ¼-inch (11.284 meters) and a height of 12 feet, 2-½ inches (3.721 meters) high. It had an empty weight of 6,451 pounds (2,926 kilograms) and gross weight of 8,000 pounds (3,629 kilograms). 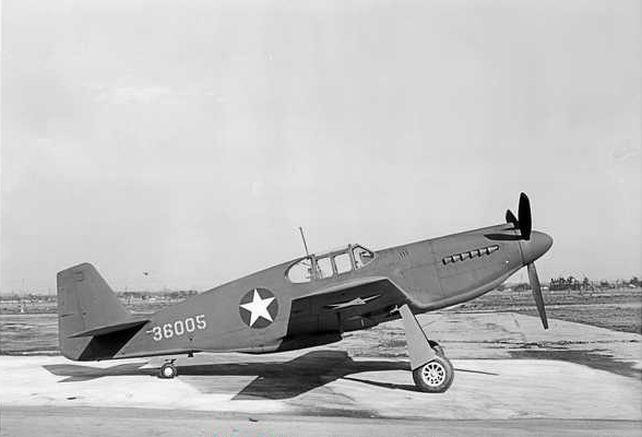 The P-51A was powered by a right-hand tractor, liquid-cooled, supercharged, 1,710.60-cubic-inch-displacement (28.032 liter) Allison Engineering Company V-1710-F20R (V-1710-81) single overhead cam (SOHC) 60° V-12 engine with a compression ratio of 6.65:1. The V-1710-81 had a Maximum Continuous Power rating of 870 horsepower at 2,600 r.p.m., at Sea Level, and 1,000 horsepower at 2,600 r.p.m. at 14,400 feet (4,389 meters). It was rated at 1,200 horsepower at 3,000 r.p.m. for takeoff. The Military Power rating was 1,125 horsepower at 3,000 r.p.m., to an altitude of 14,600 feet (4,450 meters). War Emergency Power was 1,480 horsepower. The engine drove a 10 foot, 9 inch (3.277 meter) diameter, three-bladed Curtiss Electric constant-speed propeller through a 2:1 gear reduction. The engine was 7 feet, 1.87 inches (2.181 meters) long, 3 feet, 0.75 inches (0.933 meters) high and 2 feet, 5.28 inches (0.744 meters) wide. It weighed 1,352 pounds (613 kilograms). Maximum speed of the P-51A in level flight was 415 miles per hour (668 kilometers per hour) at 10,400 feet (3,170 meters) at War Emergency Power. It could climb to 20,000 feet (6,096 meters) in 7 minutes, 3.6 seconds, and to 30,000 feet (9,144 meters) in 15 minutes, 4.8 seconds. Its service ceiling was 35,100 feet (10,699 meters) and the absolute ceiling was 36,000 feet (10,973 meters). Maximum range on internal fuel was 750 miles (1,207 kilometers). 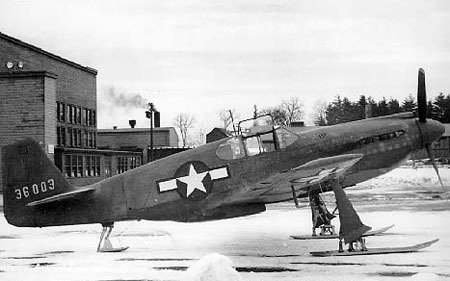 The P-51A was armed with four Browning AN-M2 .50-caliber machine guns, with two mounted in each wing. The inner guns had 350 rounds of ammunition, each, and the outer guns had 280 rounds per gun. 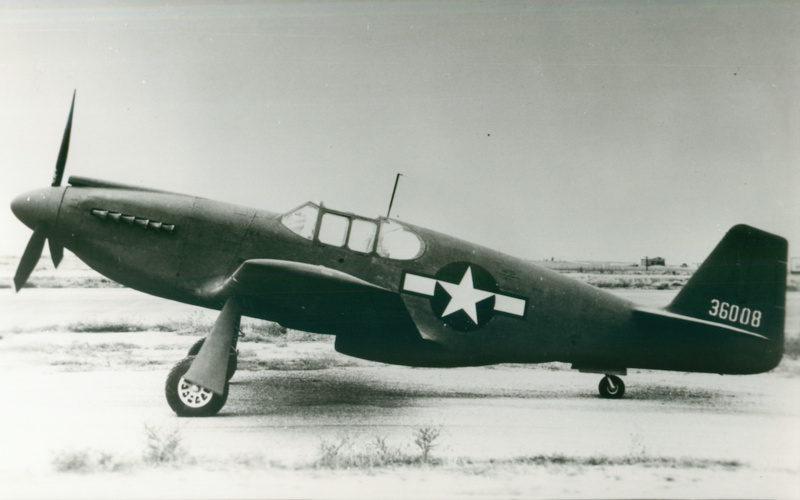 Of the 1,200 P-51A Mustangs ordered by the Army Air Corps, 310 were delivered. 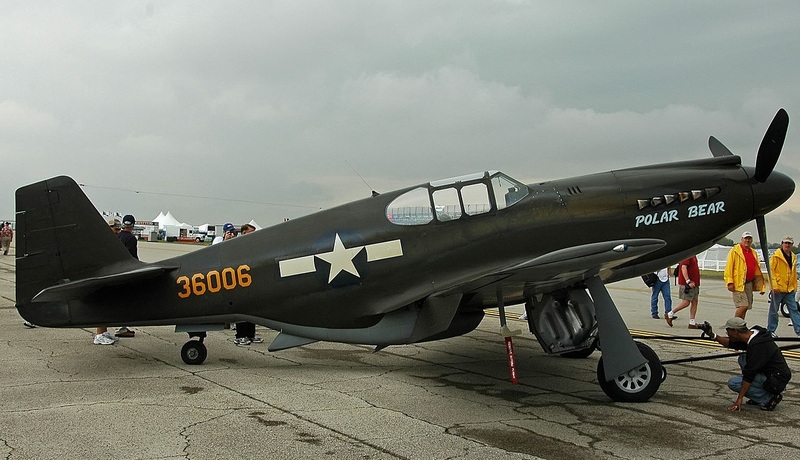 The order was changed to the Packard V-1650 Merlin-powered P-51B Mustang. Robert Creed Chilton was born 6 February 1912 at Eugene, Oregon, the third of five children of Leo Wesley Chilton, a physician, and Edith Gertrude Gray. He attended Boise High School in Idaho, graduating in 1931. Chilton participated in football, track and basketball, and also competed in the state music contest. After high school, Chilton attended the University of Oregon where he was a member of the Sigma Chi fraternity (ΣΧ). He was also a member of the Reserve Officers Training Corps (ROTC). Bob Chilton enlisted as an Aviation Cadet in the U.S. Army Air Corps, 25 June 1937. He was trained as a fighter pilot at Randolph Field and Kelly Field in Texas, and was commissioned as a Second Lieutenant in 1938. Lieutenant Chilton was assigned to fly the Curtiss P-36 Hawk with the 79th Pursuit Squadron, 20th Pursuit Group, at Barksdale Field, Louisiana. Because of a medical condition, he was released from active duty, 1 April 1939. At some time prior to 1940, Bob Chilton, married his first wife, Catherine. They lived in Santa Maria, California, where he worked as a pilot at the local airport. In January 1941, Chilton went to work as a production test pilot for North American Aviation, Inc., Inglewood, California. After just a few months, he was assigned to the NA-73X. Chilton married his second wife, Betty W. Shoemaker, 15 November 1951. 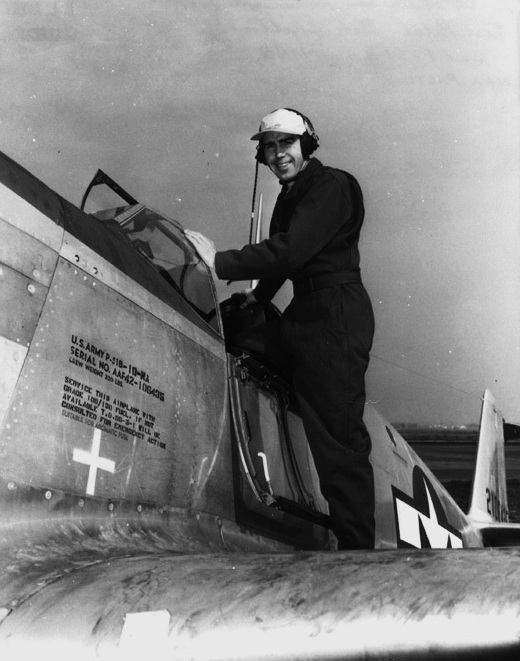 On 10 April 1952, Bob Chilton returned to active duty with the U.S. Air Force, with the rank of lieutenant colonel. He served as Chief of the Republic F-84 and F-105 Weapons System Project Office, Air Material Command, at Wright-Patterson Air Force Base, Dayton, Ohio, until 9 March 1957. From 1958, Chilton was a vice president for Horkey-Moore Associates, an engineering research and development company in Torrance, California, founded by former North American aerodynamacist Edward J. Horkey. In 1961, he followed Horkey to the Space Equipment Corporation, parent company of Thompson Industries and Kerr Products, also located in Torrance. Chilton served as corporate secretary and contracts administrator. Chilton married his third wife, Wilhelmina E. Redding (Billie E. Johnson) at Los Angeles, 26 July 1964. They divorced in 1972. In 1965, Bob Chilton returned to North American Aviation as a flight test program manager. He retired in 1977. Robert Creed Chilton died at Eugene, Oregon, 31 December 1994, at the age of 82 years.